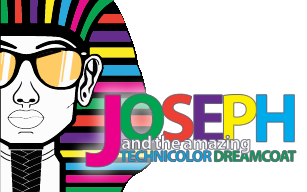 The Biblical saga of Joseph and his coat of many colors comes to vibrant life in this delightful musical parable. Joseph, his father’s favorite son, is a boy blessed with prophetic dreams. When he is sold into slavery by his jealous brothers and taken to Egypt, Joseph endures a series of adventures in which his spirit and humanity are continually challenged. He is purchased by Potiphar where thwarting advances from Potiphar’s wife lands him in jail. When news of Joseph’s gift to interpret dreams reaches the Pharaoh (wryly and riotously depicted as Elvis), Joseph is well on his way to becoming second in command. Eventually his brothers, having suffered greatly, unknowingly find themselves groveling at the feet of the brother they betrayed but no longer recognize. After testing their integrity, Joseph reveals himself leading to a heartfelt reconciliation of the sons of Israel. Set to an engaging cornucopia of musical styles, from country-western and calypso to bubble-gum pop and rock ‘n’ roll, this Old Testament tale emerges both timely and timeless. This version of JOSEPH…DREAMCOAT features extended songs and dances.